Love it or hate it, it happens to be a main ingredient in almost every granola recipe. Store varieties use it in the form of hyper-processed high-fructose corn syrup, and “healthier” companies feature alternatives like evaporated cane juice or sucanat. Try our healthfully sweetened sugar-free chocolate spreads! If your goal is to create a pure, nutritious, sugar-free granola, though, your best bet is to use real, unprocessed, organic ingredients to make a batch from scratch. That way, you can control exactly what you’re eating and how it’s prepared. You can also make your granola taste good by adding honey—a sweetener that's more nutritious than table sugar. Processed, refined sugar provides "empty calories" and can cause rapid and potentially dangerous changes in blood sugar levels, but honey contains more natural vitamins, minerals, and enzymes and doesn't spike blood sugar as high. 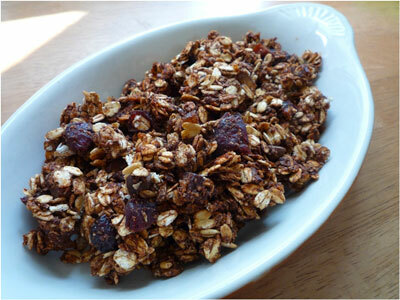 Try our Ambrosia, this "food of the gods" will fulfill your granola cravings! Rejuvenative Foods’ fresh, raw, organic, low-temp ground raw organic nut butters enhance the taste and texture of the final delicious granola. By adding nut butters the granola has a complex, rich, earthy flavor—notably different from varieties that use processed, roasted seeds or nuts—and a thicker texture. Any of the following will help make delicious and nutritious granola! Chop any especially large pieces of dried fruit, and then place all of the dry ingredients (oats through sea salt) in a large bowl. 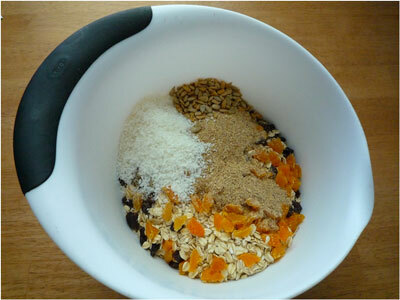 Stir the mixture once or twice to distribute the ingredients. Pour in our natural home-made soymilk and stir the mixture again until it’s evenly moistened. If it doesn’t seem very wet, that’s OK—you just want a little bit of moisture throughout. Add your favorite Rejuvenative raw organic nut butter and honey to the bowl. If the nut or seed butter is firm, it will help to warm it for a few minutes until it’s softer. Work both ingredients into the mixture until they’re evenly distributed. Lay a sheet of parchment paper onto a baking sheet, and spoon out the granola on top of the parchment paper. With the back of the spoon, press the granola down gently into an even layer. Bake the granola for 30-35 minutes, stopping halfway through to rotate the baking sheet. I like mine on the crispy side, but a shorter baking time will yield granola that is softer and just lightly toasted. Let the granola cool for at least 30 minutes before storing it in an airtight container. It will keep for three to four weeks. *Why did we choose 295 degrees rather than a higher temperature? In our controlled experiment we found the smoking point of each of our fresh raw organic oils was more than 300 degrees. By keeping the temperature low, raw organic oils in the recipe won’t smoke, and the food will taste fresher and purer. For more delicious recipes, visit our recipes page!